On a beautiful night at Gardner-Edgerton High School, in a rematch of a playoff game from last season, which Edgerton won 54-0 the Shawnee Heights Thunderbirds, came to face the Trailblazers. Heights came into the game at (5-5) on a four game winning streak. Gardner-Edgerton was (7-3) after a first round 76-40 win over Bonner Springs. Gardner-Edgerton’s defense wanted to make a statement after surrendering 40 points last week, and they made one here tonight. Edgerton forced three turnovers helping the Trailblazers route Shawnee Heights 32-0. Led by sophomore running back Traevohn Wrench the Trailblazers jumped out to a comfortable 18-0 lead over Shawnee Heights at the half. After Matt Plank of Gardner-Edgerton intercepted a pass from T-Bird quarterback Cole Foster, Wrench found the end zone twice (3,9) putting the Trailblazers up 12-0 after missed extra points. For Shawnee Heights it was missed opportunities and turnovers that plagued them here tonight. The T-Birds looked as if they were going to take the lead on the opening drive, but a missed field goal by Dakota Weaver began the miscues by Heights. 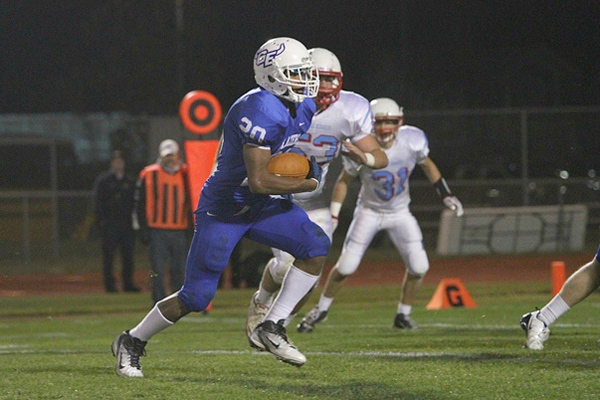 As the second half continued it was more Traevohn Wrench for the Trailblazers as he rushed for 158 yards on 26 carries. Gardner-Edgerton added to the lead on two touchdown passes by Hobby to Marcus Williams both four yards giving Gardner-Edgerton a 32-0 lead. Hobby finished 13/23 127 yards passing with two touchdowns. Shawnee Heights continued to struggle in the second half as Gardner-Edgerton’s Riley Craig intercepted a Cole Foster pass wrapping up the Trailblazers victory. For Wrench his sensational sophomore season continues. “He’s a great player no question about it, but he’s had a lot of help.” Said coach Marvin Diener about Wrench. Gardner-Edgerton will improve to (8-3) on the season and will face off with Blue Valley (10-1) next week to try and punch their ticket to the State Championship game. Last time these two met, Blue Valley beat the Trailblazers 40-6.